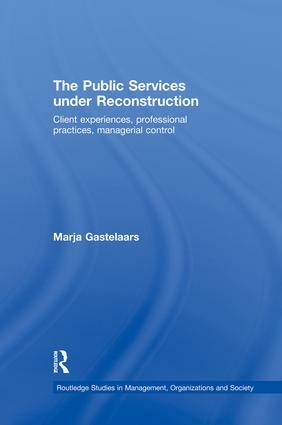 This book examines the services in and around the public domain. The author analyses a number of socio-cultural changes that are generally considered relevant to these services, including the rationalising efforts of the New Public Management and the introduction of IT. The book particularly addresses the diversity of services. It focuses on the local complexities of their day to day processes of service delivery, and on the diversity of client experiences and professional roles associated with various client relationships. A practical objective of this book is to encourage its readers to ‘redefine’ the services they professionally deal with, and move beyond the standard requirements of the New Public Management that are so often taken for granted as a starting point. Professional managers are, for instance, invited to reconsider their currently quite dominant ‘technical’ managerial perspective. Service professionals are encouraged to make sense of the risks and responsibilities involved with their day to day negotiations, including the impact of the services on the lives of their clients. Gastelaars adopts and interpretive approach to her subject, combining discourse analysis and ethnographic research to concentrate on the actual practices associated with service delivery, rather than on theories and justifications. 1. The Services In and Around the Public Domain, 2. Meanwhile, in Society, 3. 'Why are we Here?' Core Services and Client Relationships, 4. The (Re)construction of the Services: (Re)routing the Clients, 5. Whatever it Takes! The Organizational Relevance of professional responsibilities, 6. 'What am I doing here?' The Client Experience, 7. The New Management: About 'Process' and 'Control', 8. Conclusion: Where Are We Now? Marja Gastelaars is Assistant Professor at the Utrecht School of Governance in the Netherlands.